Celestial Candyland, 15 x 150 ft. Printed fabric image with choreographed projected color sequence, repeating loop, 10 LED projectors. Candyland Landing, 15 x 45 ft. Printed fabric image with choreographed projected color sequence, repeating loop, 3 LED projectors. 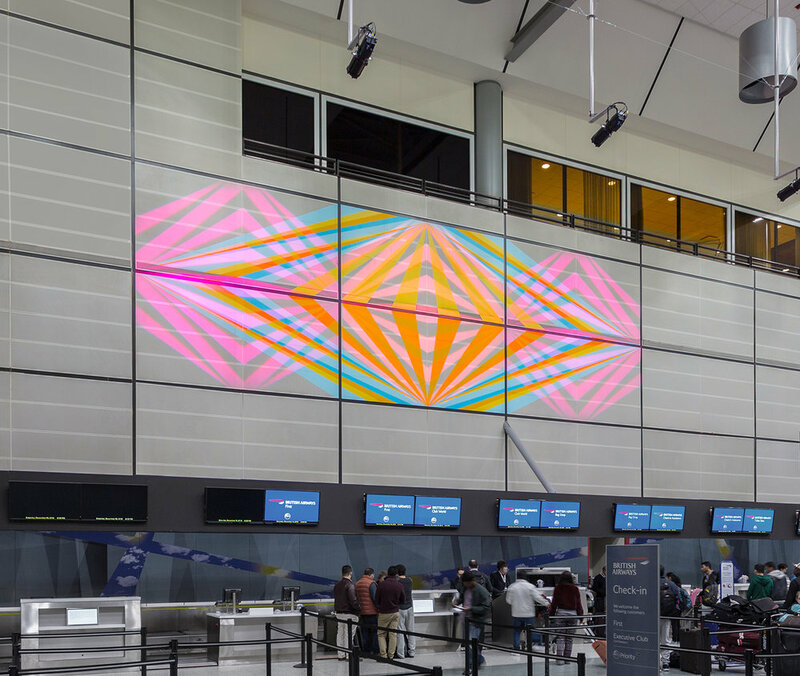 Celestial Candyland and Candyland Landing are site-specific double murals located at the Terminal D Ticketing Areas of the Houston Intercontinental Airport in Houston, TX. These works provide visitors an opportunity for time and reflection before departing on their travel adventure. Stationary geometric forms are combined with multi colored projected light sequences to evoke a meditative experience similar to that found in nature. This installation allows viewers to engage in their own experiences and interpretations. The atmospheric merging of architecture and illusion are an encouraging glimpse of the anticipated celestial journey in which the viewer is about to embark.